Color Line SuperSpeed in Larvik. When you choose Color Line, you will have a wide range of options. Select between four international ferry routes and seven ports in Norway, Germany, Denmark, and Sweden. 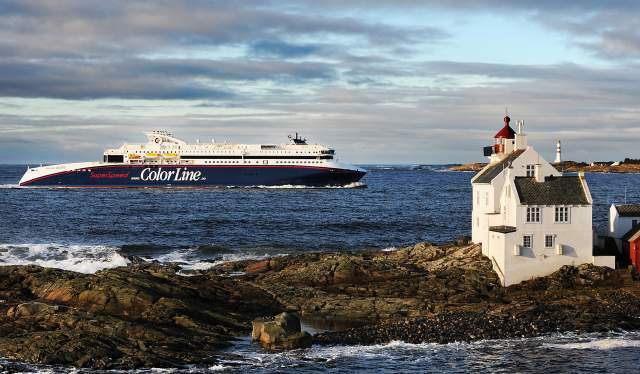 Color Line is Norway’s largest cruise ferry company, offering up to 9 daily departures to 4 destinations in Norway. All 6 ships have a high standard, some of them offer fast crossings by state-of-the-art high-speed ferries, while others provide the full cruise experience. Color Line's ships offer facilities and activities suitable for all age groups. There are all categories of restaurants and large tax-free shops with a wide selection of goods. The cruise ships Color Fantasy and Color Magic operates daily between Oslo and Kiel and are considered to be the world’s largest cruise ships with a car deck. The journey takes 20 hours, departing from Kiel at 2 pm and arriving in Oslo at 10 am the following day. Both ships are custom built for shorter cruises, placing special emphasis on the passengers’ onboard experience. All cabins are of a high standard, with TV and mini bar. The ships offer a broad array of entertainment and shopping, a spa and fitness centre and a variety of restaurants. If you are visiting Norway from Sweden, Color Line’s ferries Bohus and Color Viking operate between Strömstad and Sandefjord. The trip takes 2 hours and 30 minutes. Travel from Hirtshals in Denmark on Color Line’s SuperSpeed ships. With daily departures to Larvik and Kristiansand, the ships will guarantee you a speedy and comfortable passage while you have time to explore all the offers on board. The crossing to Larvik takes 3 hours and 45 minutes, and to Kristiansand 3 hours and 15 minutes. Color Line offers transport at competitive prices and will bring you to Norway in comfort and style. The cruise ships offer a wide range of cabins from the roomy five-star Color Class suites to the more modest three-star cabins. For Color Line your safety is a top priority. It is not enough to be safe whilst onboard, you should also feel safe. SuperSpeed - comfortable, fast ferry from Denmark.